WASHINGTON -- President Barack Obama challenged Americans on Memorial Day to fill the silence from those who died serving their country with love and support for families of the fallen, "not just with words but with our actions." 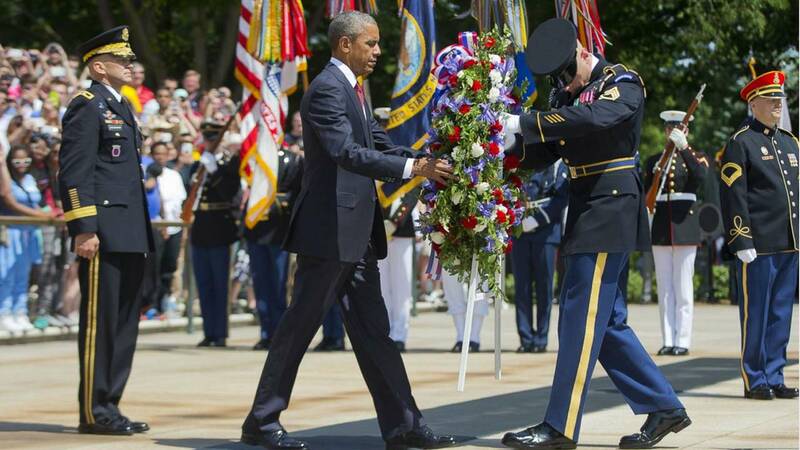 Obama laid a wreath Monday at the Tomb of the Unknowns to honor the nation's war dead. Under mostly sunny skies at Arlington National Cemetery, he bowed his head for a moment, then placed his right hand over his heart as taps was played. Obama in his address commemorated the more than 1 million people in U.S. history who paid the ultimate sacrifice. Obama said the markers at Arlington belong mostly to young Americans, those who never lived to be honored as veterans for their service. The Americans who rest here, and their families - the best of us, those from whom we asked everything - ask of us today only one thing in return: that we remember them," Obama said. In his remarks, Obama called for Americans to honor the families who lost loved ones and the battle buddies left behind. He said it's important to ensure veterans get access to good health care and jobs. "We have to do better," he said. "We have to be there not only when we need them, but when they need us." Special operations forces continue to serve in dangerous missions in Syria, Iraq and Afghanistan, even as the U.S. military presence in the latter two countries has been greatly reduced under Obama's watch. Obama acknowledged the continuing threat to service members, singling out for praise three who have died in Iraq in recent months: Master Sgt. Joshua L. Wheeler, Staff Sgt. Louis Cardin and Chief Special Warfare Operator Charles Keating IV. Obama said Keating joined the Navy SEALs because it was the hardest thing to do. He quoted a platoon mate who told Keating's parents in a letter soon after their son's death "please tell everyone Chuck saved a lot of lives today." On Cardin, Obama said he gave his life while protecting the Marines under his command. "Putting others before himself was what Louis did best." Obama noted that Wheeler was deployed to Iraq and Afghanistan 14 times and earned 11 Bronze Stars. He also participated in a mission in October that rescued some 70 hostages. He died before his son, David, could be born, but that son and Wheeler's widow, Ashley, were at Monday's ceremony. "Today this husband and father rests here in Arlington in Section 60," Obama said. "And as Americans, we resolve to be better, better people, better citizens because of Master Sergeant Joshua Wheeler." Prior to traveling to Arlington, Obama held a breakfast reception at the White House for military leaders, family members of fallen service members and veterans groups. Click here for more stories on Memorial Day.